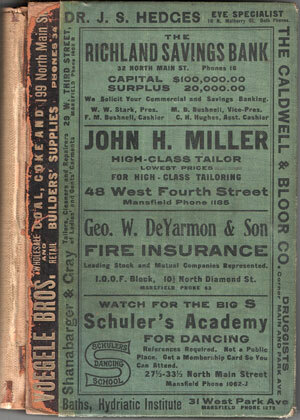 Published by The Burch Directory Co., Akron, Ohio. 1908-09. Covers show some wear. No spine name strip. Former library book with some markings. Inside pages are overall nice and clean. A directory of residents of Mansfield, Ohio in 1908-09, listing the name of the head of household, name of wife, occupation and address. Hardbound, 425 pages. Also includes numerous business ads.